Indian rice kheer recipe (as known in North India)or Indian rice pudding recipe also known as rice payasam or ari payasam in South India is a very delicious and easy to make rice kheer recipe which is a one pot pudding dessert recipe too. Vermicelli kheer is another very delicious Indian dessert poularly used for special occasions. You can make this yummy rice pudding or rice kheer using milkmaid on stove top. Just make sure to use a thick bottomed pan or pot that can contain the amount of kheer you are intending to make. 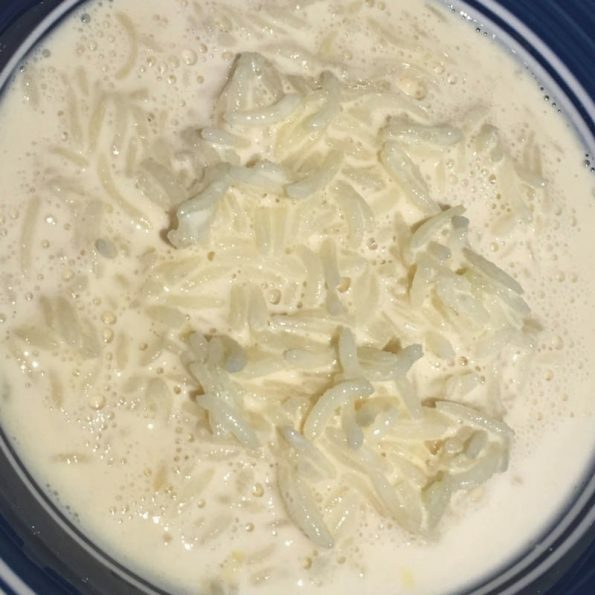 I have also adjusted the ingredients so I can use one cup of rice to make the kheer – so I had to add more milk and sugar ( in my previous post on rice kheer using milkmaid, I used only 1/2 cup of rice). Alternatively, you can also use 2 cans of milkmaid and follow the measurements of ingredients in my previous post on rice kheer using milmaid. I had only one can of milkmaid on hand, so I added more milk and sugar to make the kheer. 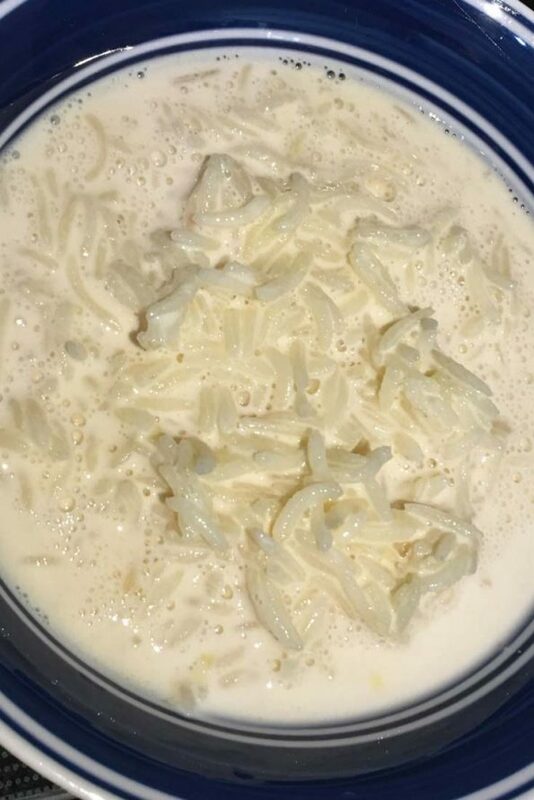 If you need to make more kheer, please adjust the ingredients accordingly ( you will need more milk and sugar if you increase the amount of rice). Here is the easy recipe for rice kheer using milkmaid on stove top. Heat a thick bottomed pan or pot, add the ghee. When the ghee is hot, add the washed rice and fry in low flames for about 1 minutes. Add the sugar and whole milk to the rice, mix well. Keep the stove on high flame and wait for the milk rice mixture to boil – make sure you stir constantly to avoid any burning of milk at the bottom of the pan. A spatula is ideal for stirring the kheer. When the mixture starts boiling, close the pan and cook in very low flame for about 10 minutes. After 10 minutes, open the pan, mix everything well and add the milkmaid or any kind of sweetened condensed milk you have on hand. Mix well, then increase the flame and wait for the mixture to boil again – make sure to stir continuously. When it starts boiling, allow the mixture to boil for about 1 to 2 minutes till all the ingredients are combined well. Delicious rice kheer is ready to serve! Serve the kheer hot, chilled or at room temperature. Kheer tends to thicken as it cools down, so if you want a more liquid like consistency, you can add more whole milk. Notes: This is a very basic and simple recipe for rice kheer using milkmaid which you can easily make on stove top. I haven’t used any ingredients extra here, but you can always make your kheer more delicious by adding crushed cardamom, saffron strands or fried raisins and cashews. 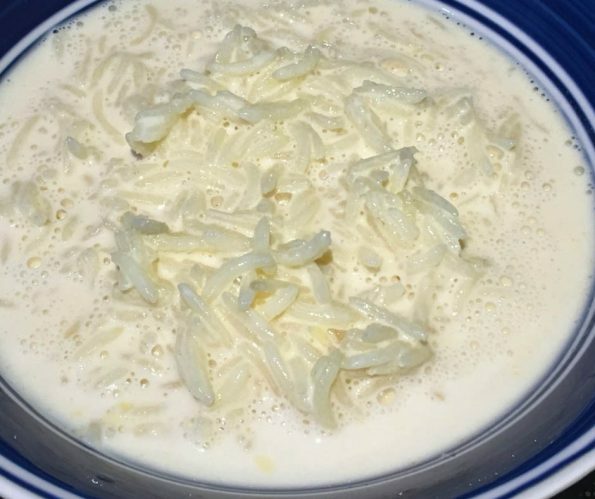 Hope you found this post on Indian rice kheer recipe or Indian rice pudding dessert recipe with condensed milk easy and helpful!